Fluoride: Do I Need To Filter It? FLUORIDE IN WATER: SHOULD I FILTER IT? Whether or not flouride in water leads to fluoride toxicity is controversial. I have studied it at length and the evidence does seem to weigh in favor of fluoride toxicity and that it is best to filter fluoride from our drinking water. 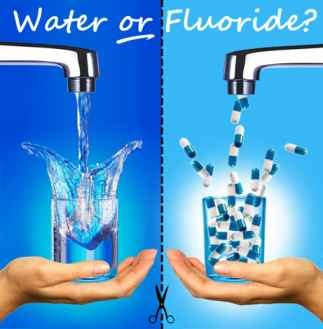 On the other hand the subject of fluroide toxicity is debatable and since most of us have been drinking fluoride in water all our lives, it seems that it probably isn't going to kill you to have some in your water. So ultimately it is your choice. There is no doubt that fluoride toxicity is real. The question that is up for debate is whether there is enough fluoride in our water to cause harm to us. Fluoride Toxicity: Is it A True Risk Or Much Ado About Nothing? What is fluoride in water for? What are fluoride's health effects? This health effects language is not intended to catalog all possible health effects for fluoride. Rather, it is intended to inform consumers of some of the possible health effects associated with fluoride in drinking water." Ultimately the question "What is fluoride?" is not as important as the question: "Is there a health risk from fluoride toxicity when it is added to drinking water?" We get fluoride from our toothpaste already so do we really need to get fluoride in water we drink, too? Putting fluoride in water is an an attempt to prevent tooth decay. But it is not necessary to DRINK it in order to prevent tooth decay. This is well known by scientists so it leads me to question: Why, then, is it put into our drinking water? "Is FLUORIDE in water necessary for healthy teeth? NO. Most recent, large-scale studies have found that fluoridated water provides only a minor benefit to teeth, or no demonstrable benefit at all. According to a recent Canadian government review: "The magnitude of fluoridation's effect is not large in absolute terms, is often not statistically significant and may not be of clinical significance." Moreover, according to the National Academy of Sciences, fluoride is not an essential nutrient. This means that no human disease - including tooth decay - will result from a "deficiency" of fluoride. Thus, unlike real nutrients like calcium and magnesium, the human body does not need fluoride for any physiological process. Furthermore, just try to find a toothpaste without fluoride in it! If you are brushing your teeth daily, you are almost certainly getting more than enough flouride right on your teeth, where - if anywhere - it belongs! What makes fluoride different from other chemicals added to water? In contrast to other chemicals added to water, fluoride does not treat the water, or make the water safer to drink. Fluoride is the only chemical added to water for the sole purpose of medication (to prevent tooth decay -- a non-waterborne disease). Doesn’t everyone put fluoride in water? NO. While most water supplies in the United States are artificially fluoridated, most water supplies in other western countries are not. In western Europe, most countries have rejected water fluoridation due to fluoride toxicity, including: Austria, Belgium, Denmark, Finland, France, Germany, Italy, Luxembourg, Netherlands, Norway, Scotland, Sweden, and Switzerland. Less than 10 countries in the world fluoridate more than 50% of their water supplies, while almost half of the world’s population drinking fluoridated water reside in North America (Canada & US). Where does the fluoride in water (that is, added to our drinking water) come from? The main fluoride chemical added to water (hydrofluorosilicic acid) is an industrial by-product from the phosphate fertilizer industry. Unlike the fluoride used in toothpaste, hydrofluorosilicic acid is not pharmaceutical-grade quality. [emphasis added by this webmaster] It is an unpurified, industrial-grade, corrosive acid which has been linked, in several recent studies, to increased levels of lead in children’s blood. Even the EPA is still studying fluoride in water and can't seem to decide if fluoride toxicity is a problem or not. My feeling is that where there'e smoke there's fire. There must be some danger from fluoride in water or else why is the government still studying it, after all these years. And as you read above, many other countries have banned it. Certainly fluoride toxicity is a danger, the question is how much fluoride is toxic? "What are EPA's drinking water regulations for fluoride? In 1974, Congress passed the Safe Drinking Water Act. This law requires EPA to determine the level of contaminants in drinking water at which no adverse health effects are likely to occur. These non-enforceable health goals, based solely on possible health risks and exposure over a lifetime with an adequate margin of safety, are called maximum contaminant level goals (MCLG). [Also called PHG or Public Health Goals in some Water Quality Reports.] Contaminants are any physical, chemical, biological or radiological substances or matter in water. The MCLG for fluoride is 4.0 mg/L or 4.0 ppm. EPA has set this level of protection based on the best available science to prevent potential health problems. EPA has set an enforceable regulation for fluoride, called a maximum contaminant level (MCL), at 4.0 mg/L or 4.0 ppm. MCLs are set as close to the health goals as possible, considering cost, benefits and the ability of public water systems to detect and remove contaminants [emphasis by this webmaster; in other words the MCL is set not based on the level of arsenic or fluoride toxicity for example, but rather it is based on the affordabilty and practicality of reducing it!] using suitable treatment technologies. In this case, the MCL equals the MCLG, because analytical methods or treatment technology do not pose any limitation. EPA has also set a secondary standard (SMCL) for fluoride in water at 2.0 mg/L or 2.0 ppm. Secondary standards are non-enforceable guidelines regulating contaminants that may cause cosmetic effects (such as skin or tooth discoloration) or aesthetic effects (such as taste, odor, or color) in drinking water. EPA recommends secondary standards to water systems but does not require systems to comply. However, states may choose to adopt them as enforceable standards. Tooth discoloration and/or pitting is caused by excess fluoride exposures during the formative period prior to eruption of the teeth in children. The secondary standard of 2.0 mg/L is intended as a guideline for an upper bound level in areas which have high levels of naturally occurring fluoride. The level of the SMCL was set based upon a balancing of the beneficial effects of protection from tooth decay and the undesirable effects of excessive exposures leading to discoloration. States may set more stringent drinking water MCLGs and MCLs for fluoride in water, than the EPA. The drinking water standards are currently under review... "
Although I do not currently use a reverse osmosis water filter system, when I read this I am considering getting one. Fluoride toxicity does seem to be a real risk and putting fluoride in water is at least STUPID, if not dangerous. There is no good reason to put it in water, so you have to ask yourself Why are they putting it in there?? Whether it is enough to cause fluoride toxicity, it may be enough to cause health problems. If you have already decided that fluoride toxicity in your water is too risky, you will want to buy a good quality reverse osmosis system. WHAT IS THE BEST FLUORIDE FILTER? REVERSE OSMOSIS is the only way to filter fluoride from your water* and it also reduces arsenic, trivalent and hexavalent chromium, radon and other contaminants as well that regular carbon block filters do not reduce. Most reverse osmosis filter systems that are any good use a carbon block filter along with the RO technology. But Multipure has the advantage over all the others because they use the carbon block filter that is NSF Certified to reduce more contaminants than any other filter you can buy. (You see, RO filters themselves do not reduce all contaminants, so you have to "supplement" any RO filter with a carbon filter system. Multipure has the best carbon block filter, so it stands to reason you will want an RO system that uses Multipure's superior carbon block technology. The Aqua RO, Multipure's Reverse Osmosis unit. Combines RO technology with Multipure's solid carbon block filtration. 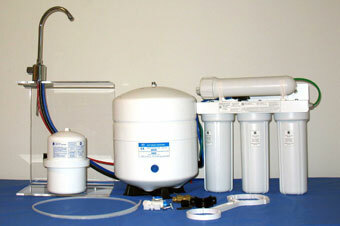 In addition to what the Reverse Osmosis water filter system reduces, such as the danger of arsenic, radon, trivalent chromium and fluoride toxicity) the Aqua RO's supplemental carbon block filter also reduces a wide range of other contaminants including Cysts, Lead, PCBs, MTBE, Mercury, Asbestos, Chloramine, VOCs and many more. Find Out More About The Multipure Aqua RO RO system! For More About Reverse Osmosis in general, click here. Multipure Drinking Water Systems are tested and certified by NSF International to reduce the widest range of contaminants of health concern. In the case of our RO sytem it reduces arsenic, trivalent and hexavalent chromium, radon, and fluoride in water, as well as the 60+ contaminants reduced by the 750 filter (same one as in the Aquaversa). If fluoride toxicity is something you are concerned about, please check out our Reverse Osmosis filter in more detail at the link above. Thanks! And good health to you! We hope you have decided to buy the best water filter today!